So, my lovlies, if you’re a little less than savvy in the bread making department, maybe you should give this little beauty a try. It makes your house small absolutely amazing, and it tastes great too. Download the .pdf recipe here. I can smell it from here. Please, please can I have some? I’m going to give your recipe a try, but I think I may have to halve the recipe. 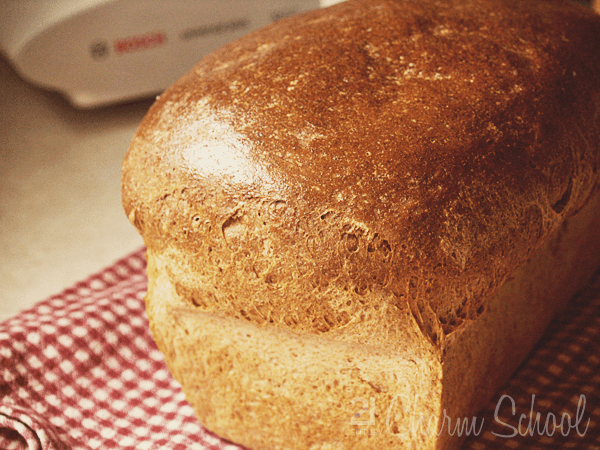 I have made quite a bit of whole wheat bread in the past and have found that a lot depends on the wheat itself. I have had wheat that turned out wonderful bread every time, and I have had wheat that turned out little flat loaves no matter what. The best I ever had was from a health food store that carried Deaf Smith County wheat, sure wish I could find some more of the same.